‘Golden Generation’: curse or blessing? It was March 1994. I was returning from Bible Study in church when I heard “Gooooalllll” ring out as I was about to enter our face-me-I-face-you ‘compound’ in one of Bariga’s crevice-riddled, muddy-water filled streets. We did not have a good television, so I peeked through one of the neighbours’ window just in time to see the replay of Rashidi Yekini lofting the ball over Gabon’s goalkeeper to score one of the goals in a comprehensive victory. 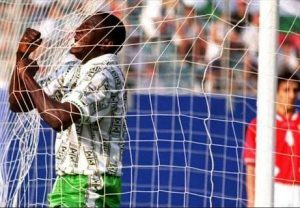 And who can forget the iconic images of the Goalsfather, putting his hands through the netting as he opened the floodgates to yet another, but even more significant 3-0 victory against Bulgaria, which was Nigeria’s first-ever goal at a World Cup, and Nigeria’s first win at the first time of asking. We did not have to wait too long before Nigeria, mixing the victorious cadet boys from 1993 in Japan with a splash of the all-conquering team of 1994, would tip the scales in Atlanta in 1996 and bring us Africa’s first-ever gold medal in the football event of the Olympic Games, beating giants Brazil and Argentina for good measure. It is 20 years down the line, and bar the 2013 AFCON, we still reckon those group of boys were Nigeria’s ‘Golden Generation’, which everyone reckons would have won the AFCON in 1996 and 1998, if not for that ignominious CAF ban. Well, when you consider golden generations that the world has heard about after that, it would be likely that we got the luck of the draw. 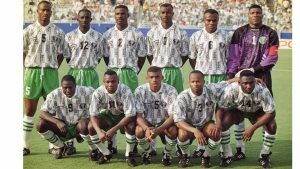 Our Golden Generation, put together by Clemens Westerhof and sprinkled with such prodigious talents like leaders from the back in Stephen Keshi, Uche Okechukwu and Augustine Eguavoen; midfielder masterminds such as Austin ‘Jay Jay’ Okocha, Sunday Oliseh, and Mutiu Adepoju; and top-drawer attackers including the aforementioned Yekini, Emmanuel Amuneke, Daniel Amokachi and the rest. 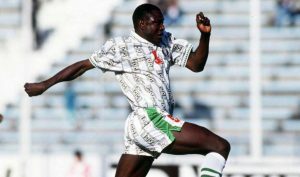 One can’t forget Peter Rufai, Samson Siasia, Finidi George and Nigeria’s most decorated footballer, Kanu Nwankwo (the only Nigerian yet to have won titles in three different top leagues in Europe). And boy, when they were in form, the world stood and watched in awe because the football was breathtaking at times. Little wonder, they are still Africa’s highest-ranked team in the world at 5th position in 1994. I can hear someone sigh and say, “Those were the days”, right? And not just Nigeria. One only has to look at Barcelona (Cryuff’s, early Rijkaard era, and the current Pep legacy), Spain’s all-conquering team from 2008 to 2012, and others to see that a golden generation is a delight to experience. They embody all that is good of the sport and express the rationale behind it being called “the beautiful game”. Sad thing about golden generations is they are usually hard to replace. In most cases, the football authorities pay so much attention to the talent that they have at their disposal, and do not take to mind the nurturing and development of the next generation that when the current stars start to ebb and fade, the quality available to replace them are, at best, only good, compared to the great that was. 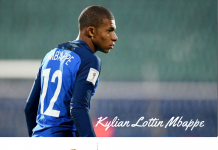 Think of France after 2001 where they had to struggle for years until Zidane came out of retirement in 2006 to almost-singlehandedly give them a semblance of the heights they reached in 1998 – the World Cup final – and after that, they have not been as good again. Even worse is the fact that while they are still golden, it may be hard to manage and get results. 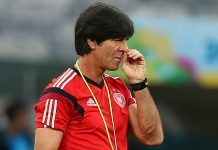 Golden generations are a constellation of stars, individual geniuses in different positions, and not every golden generation has the luck of having a Clemens Westerhof who will get it together and make the stars a team to be feared. Which perhaps explains why other golden generations however, have not fared so much. England from 2002 to 2008, with Beckham, Lampard, Ferdinand – the Man U one, Scholes, Gerrard and the like; Portugal with Figo, Rui Costa, Conceicao, and a blooding young Cristiano; the current Belgium side, and the list goes on. All these great teams could not produce one major trophy and it was not down to lack of talent – because they were embarrassingly rich with it. Next articleWhich is the Best League in the World, Really?